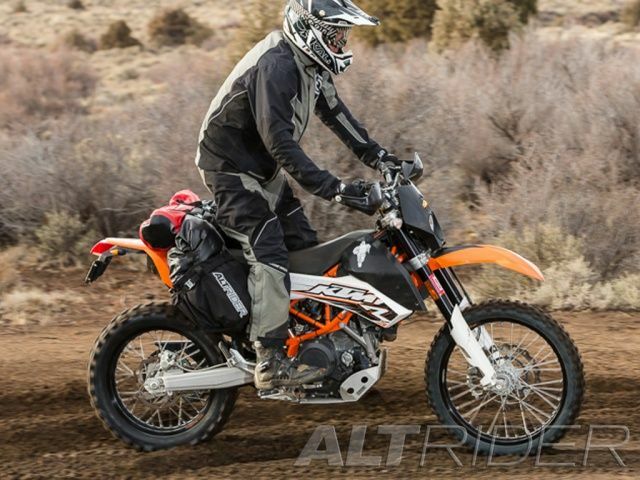 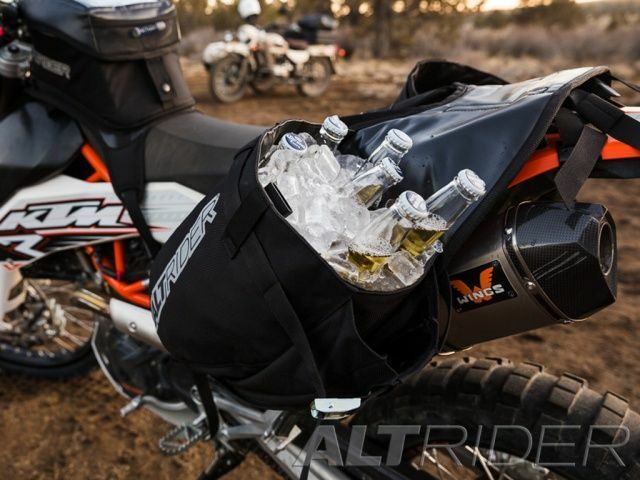 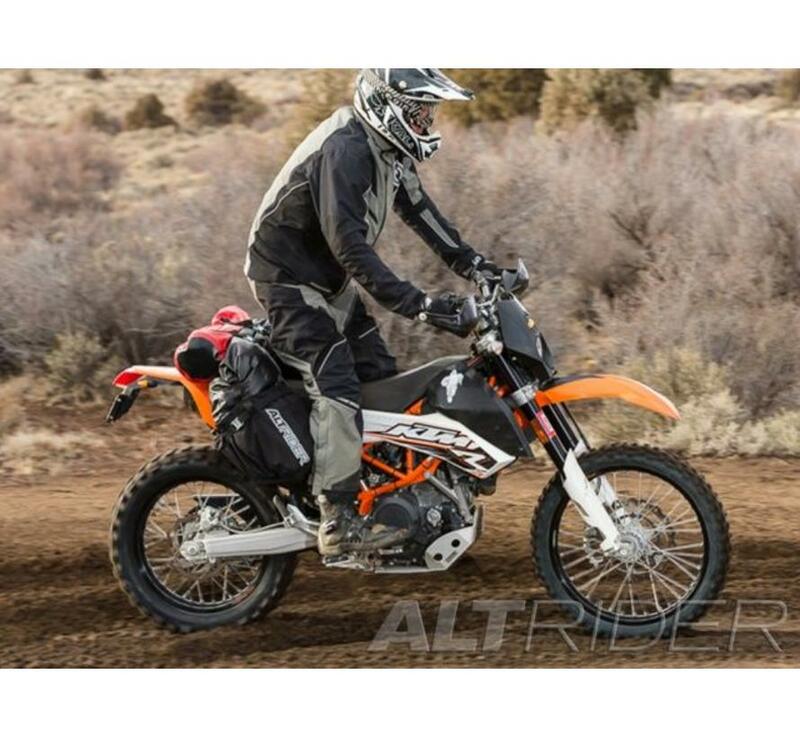 The AltRider Hemisphere Saddlebag utilizes a rack-free design that was created with dual-sport machines in mind – bikes like the Honda XR & CRF, Suzuki DR, Yamaha WR, Husky TE, and KTM EXC. 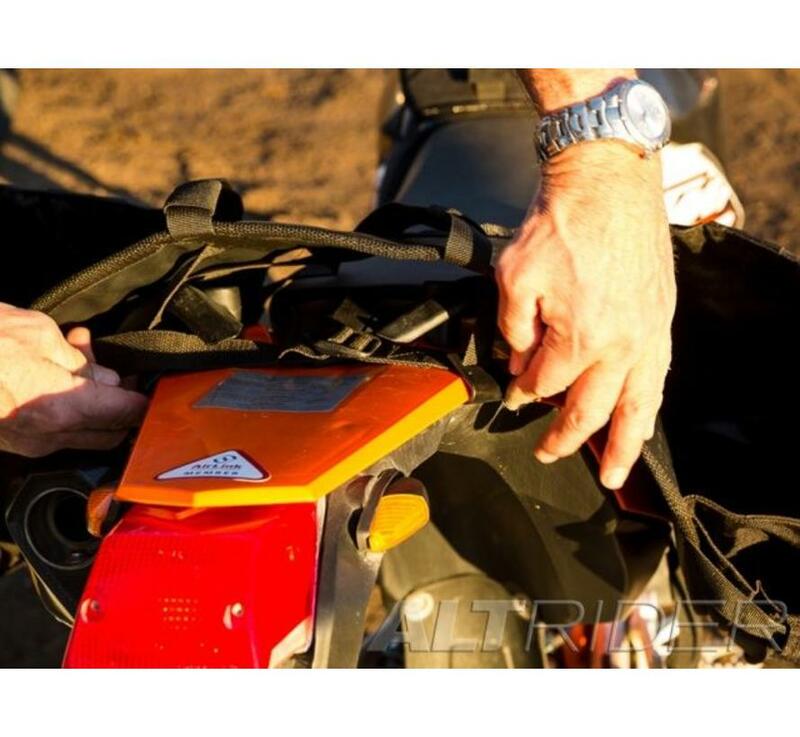 The universal design will fit any dirt bike and is also compatible with many adventure motorcycles. 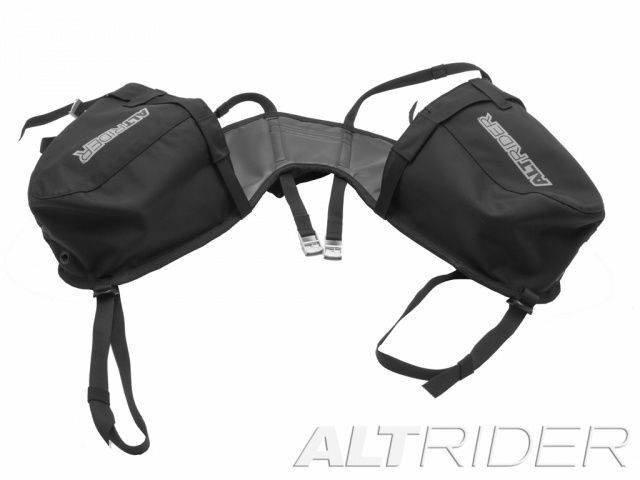 The main compartment of the Hemisphere Saddlebag has a sizable capacity of approximately 45 liters. 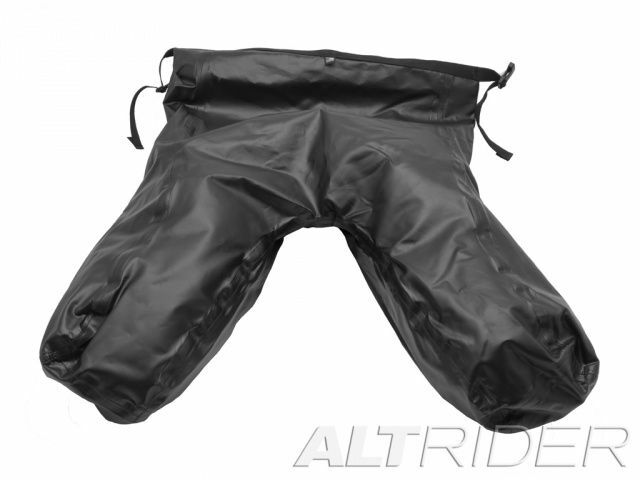 It features a unique roll top design that eliminates difficult zippers and is waterproof when used correctly. 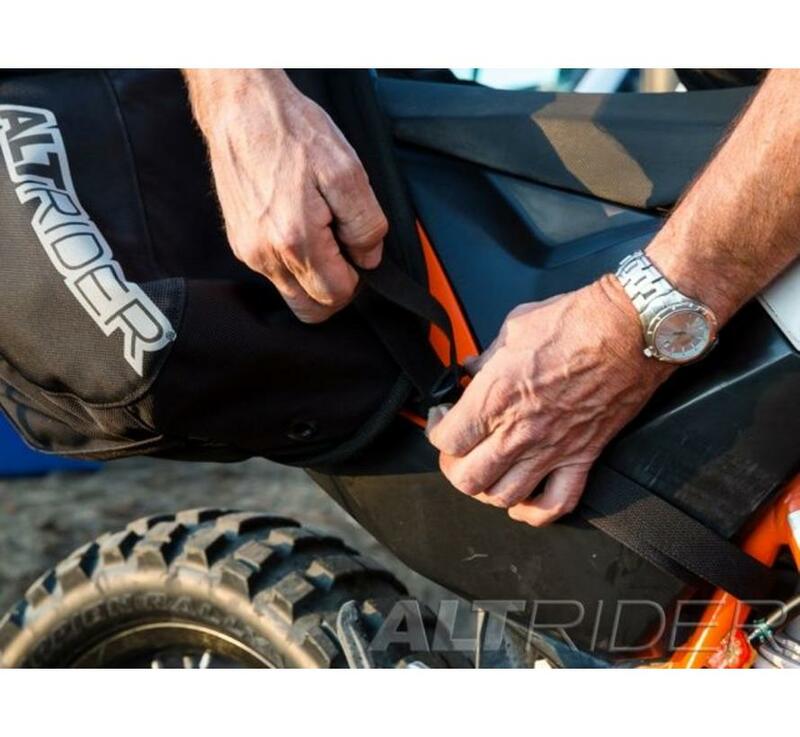 The bag is hand crafted from tough ballistic and vinyl coated polyester materials that will hold up to the abuse dual-sport bikes were meant for. 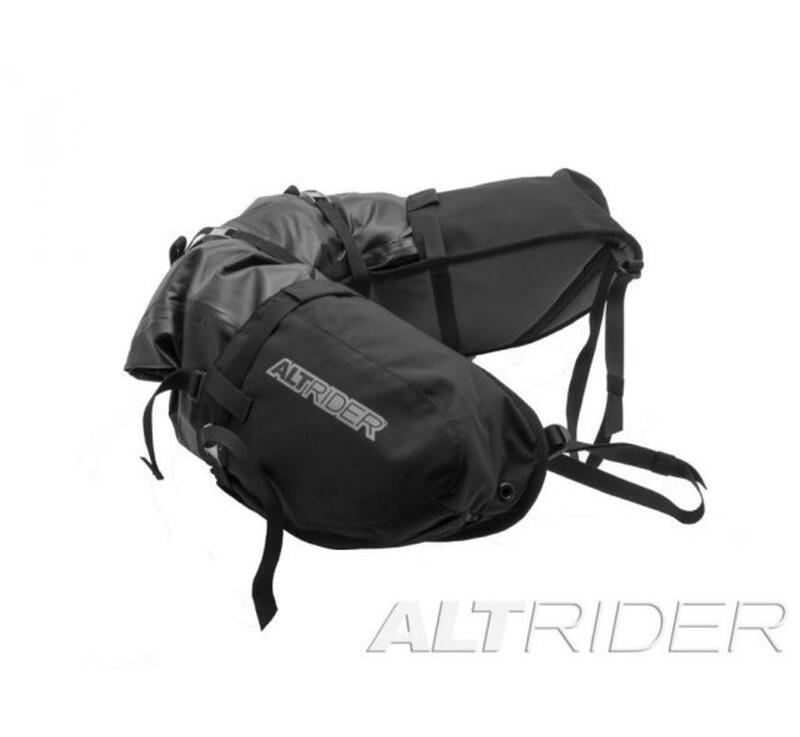 While seams are typically a trouble spot for waterproof luggage, the AltRider design uses military grade thread and fully taped seams to ensure complete isolation from the elements. 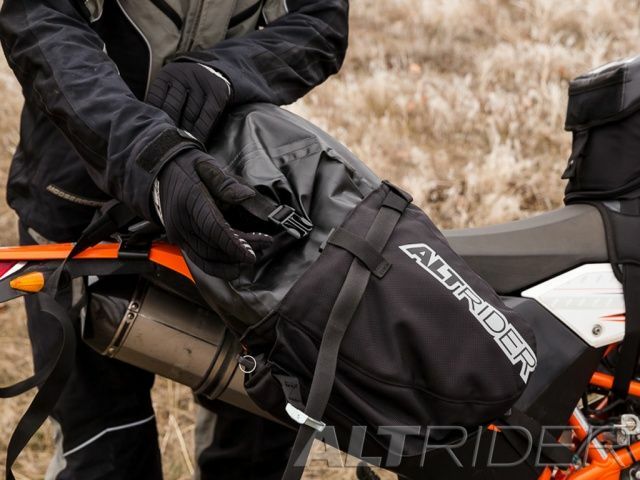 The Hemisphere Saddlebag also includes a custom compression sack that stashes inside the saddlebag -- perfect for condensing your cold weather sleeping bag. 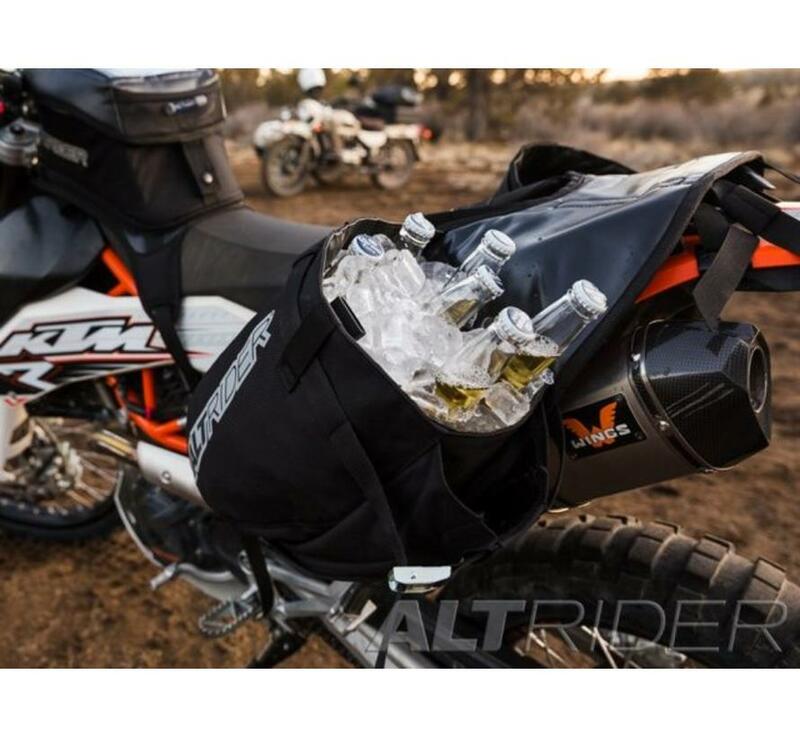 The design features two exterior stash pockets for tools, extra inner tubes, a tire pump or even a 1.5 liter fuel bottle. 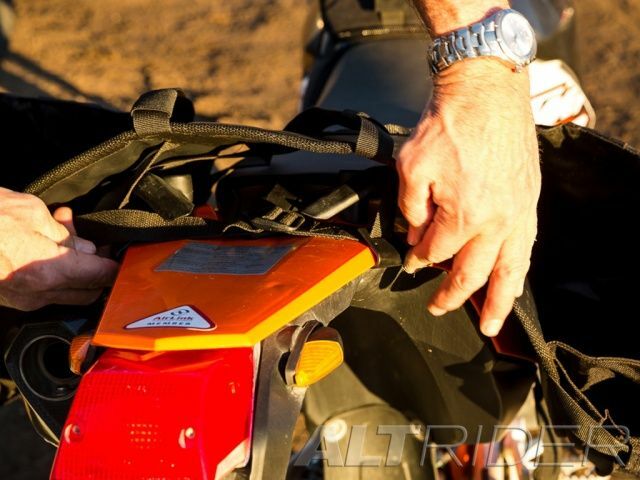 Placing these oft-used items outside the main compartment allows for easy access during trail side repairs and keeps the weight of a heavy tool pouch or fuel bottle lower to the ground -- significantly improving balance and handling of the bike. 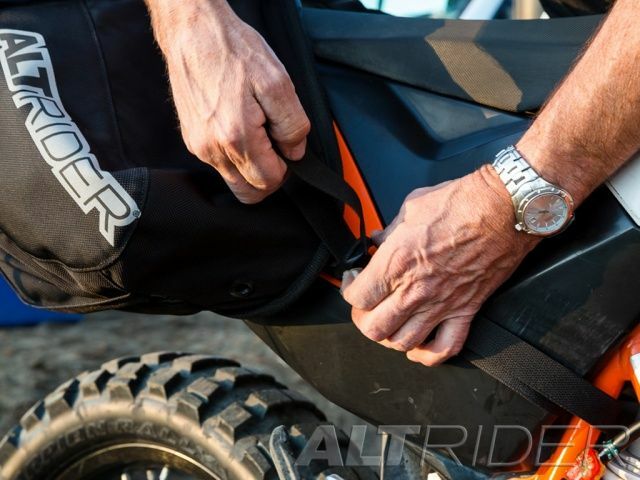 The Hemisphere Saddlebag mounts with ballistic nylon webbing straps for a full strength connection to the bike, allowing worry-free exploration of wherever your adventure takes you. Metal cam-lock buckles on the straps prevent any movement of the kit -- regardless of riding conditions. 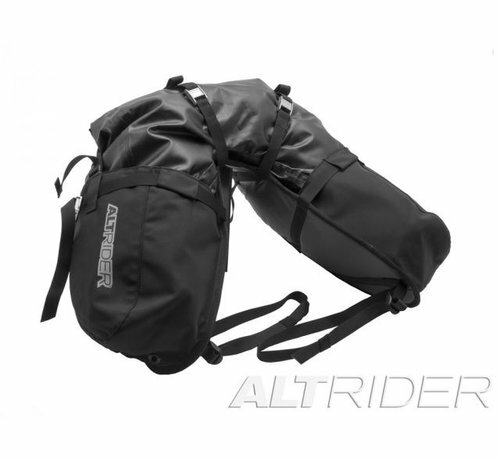 The design also features two upper nylon straps with metal cam-lock buckles to secure extra items to the bag such as a tent or another dry bag. 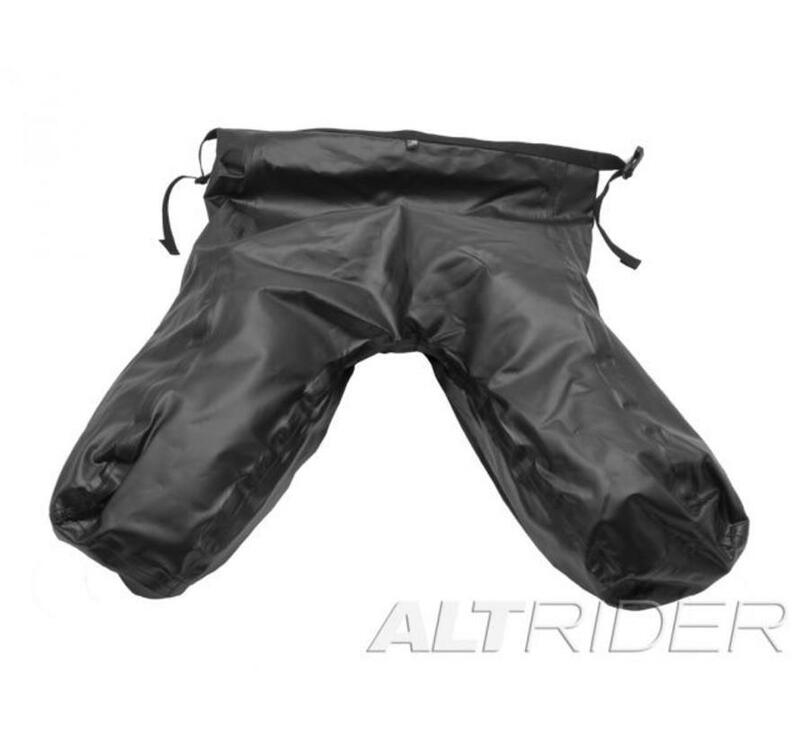 Reflective logos on the outside of the bag allow high visibility for increased safety in low-light or night riding. 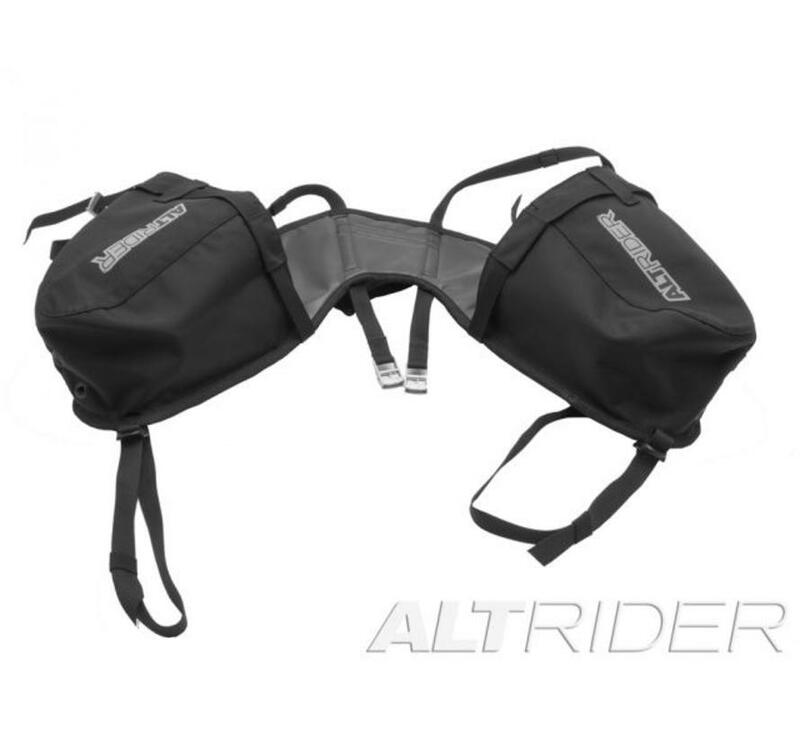 Note: The Hemisphere Saddlebag may contact, or cause your plastic body panels to contact, the hot exhaust on your motorcycle. 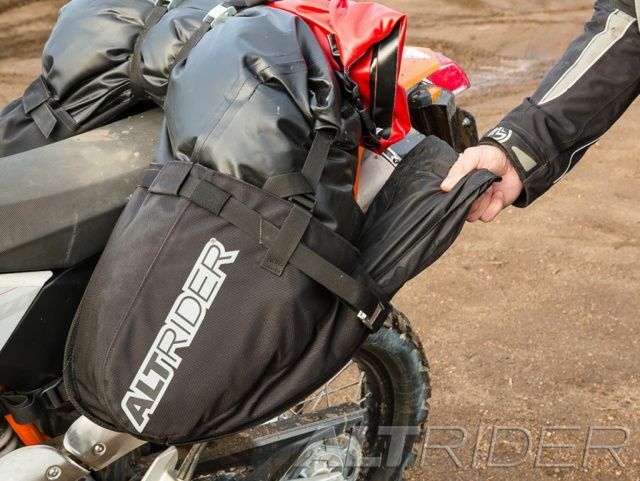 Prevent damage to your luggage and motorcycle with the AltRider Universal Exhaust Heat Shield. 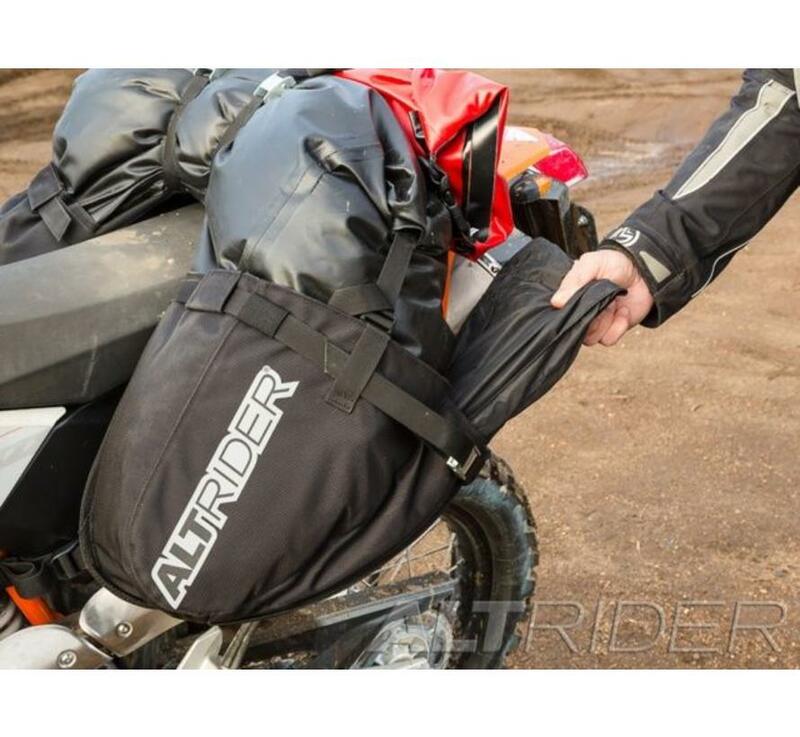 AltRider Hemisphere Luggage was originally designed to fill the needs of the riders - a piece of luggage that encompasses the adventure lifestyle. 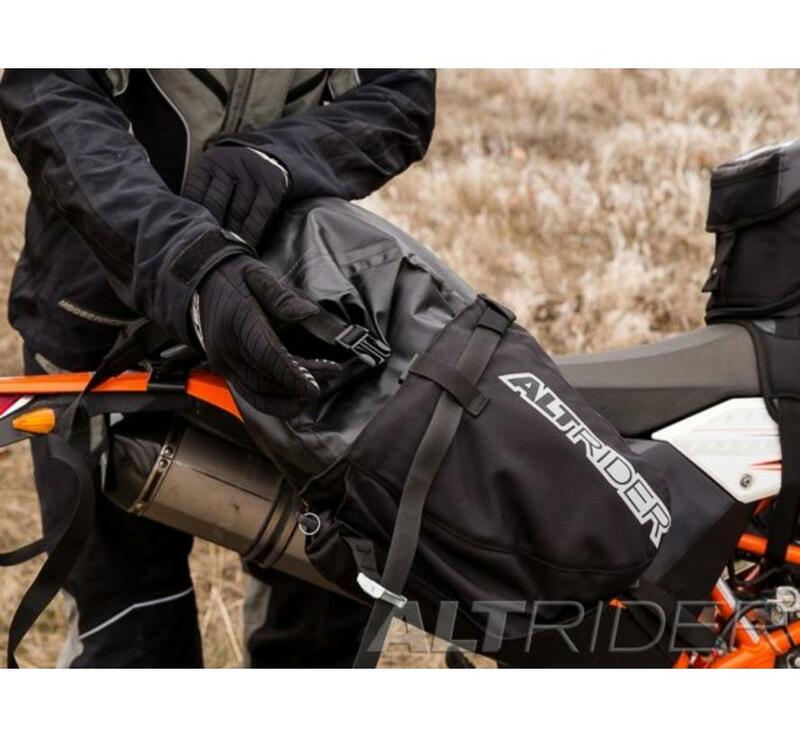 The smart features of the Hemisphere luggage were designed by riders to solve problems with other luggage designs -- difficult to use zippers that jam easily, seams that aren’t waterproof, or bags that don’t hold up to abuse from real rides. 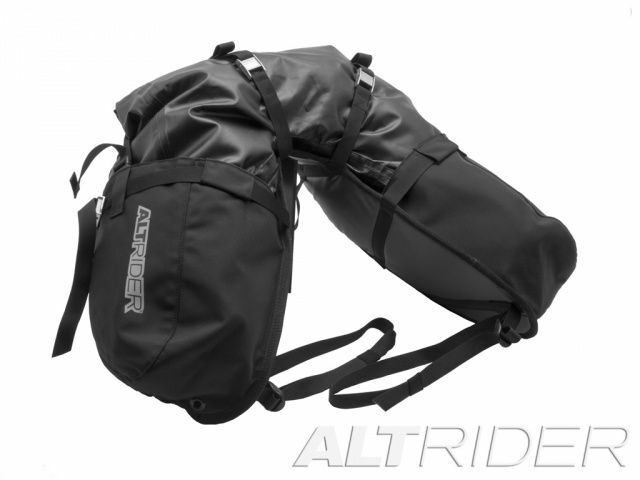 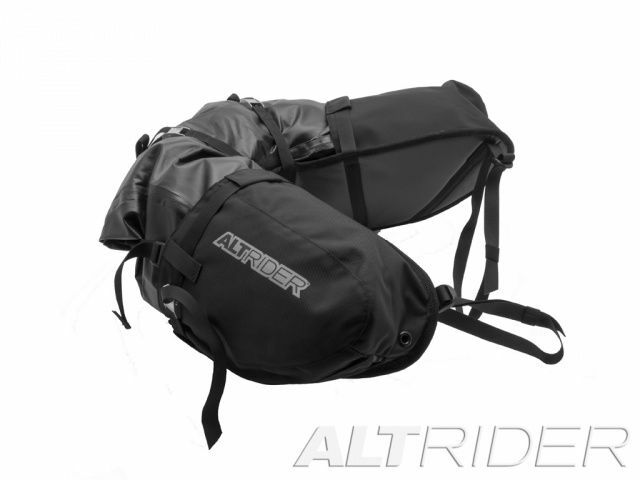 Check out the other bags in the Hemisphere line --AltRider Hemisphere Soft Panniers and AltRider Hemisphere Tank Bag.